'Tis the season to stack up on your favorite wine or discover new ones! 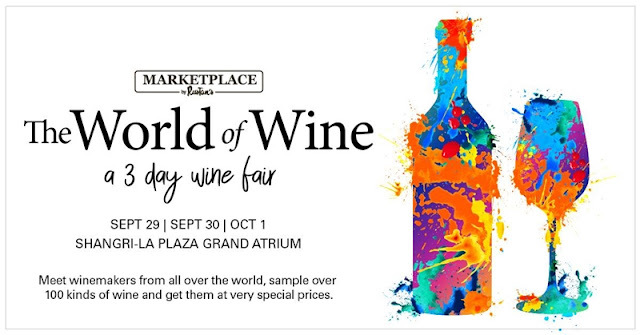 Marketplace by Rustan's is hosting a three-day wine fair at the Shangri-La Plaza Grand Atrium to bring you a taste of the best wines from the world's finest vineyards. Twelve highly-respected winemakers coming from Australia, France, Spain and Argentina will be bringing their best bottles to the fair and share their expertise. Learn, taste and take home a bottle with you during the "Straight from the Vineyard" talks for only P199 per session for Fresh, Marketplace and Sapphire card holders / P500 per session for non card holders. Note: each session is limited to 20 participants only. Also joining the roster of sommeliers are Graham Cranswick Smith from the Cranswick winery, Sam Mete from the Robert Oatley Vineyards and Michael Rogers from Wines Overland. In The World of Wine fair, Marketplace by Rustan's specially curated a wine list featuring quality choices from the rarest bottles in the world to vintage wines, which can be availed of at the best value. Follow me on Instagram for more photos from the fair. Purchase one of the features bottles of wine at the fair at 10% off. Buy six bottles or more and get 15% discount. Also, every P5000 spend during the wine fair gets you closer to winning a trip for two to Bordeaux, France with two nights stay at Château Lamothe Bergeron! Other prizes include a trip for two to Australia with a private vineyard tour of Tamburlaine, Cedar Creek Botrytis Semillon 2010 375ml and Tamburlaine Orange Reserve 2002 750ml. For more information visit www.rustansfresh.com, follow and like rustansfresh on Facebook and @rustansfresh on Instagram and Twitter.